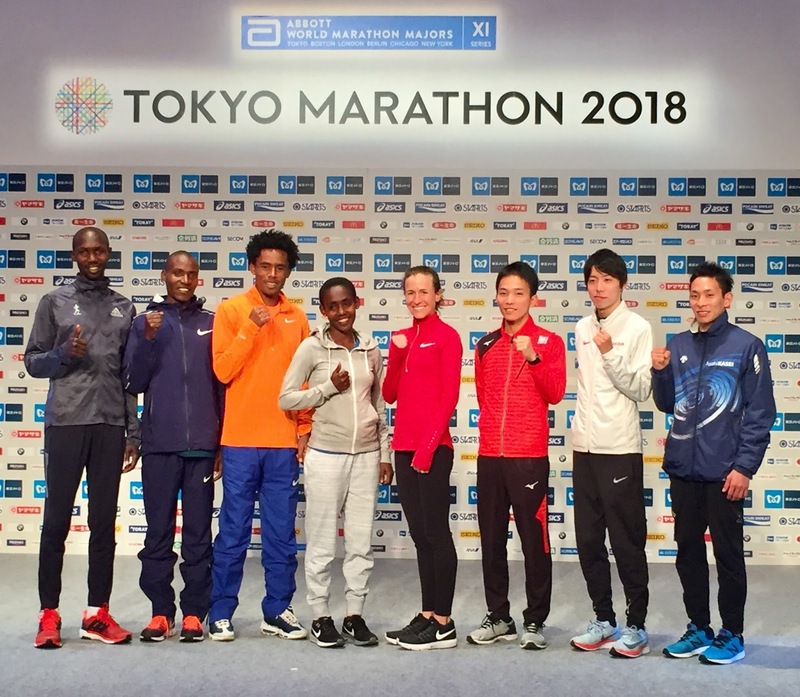 After stepping up to the big leagues last year with course records in the 2:03 and 2:19 range, the Tokyo Marathon hopes to go one better this year. Men's course record setter Wilson Kipsang (Kenya) is back, stepping up from a 2:03:50 prediction for Tokyo in January to a 2:02:50 world record prediction at Friday's pre-race press conference. In the unmentioned absence of women's course record breaker Sarah Chepchirchir the top-ranked woman is Ruti Aga (Ethiopia), coming in hot off a 1:06:39 win last month in Houston and turning heads at the press conference with a boldly mumbled 2:18:00 prediction. Management for both Kipsang and Aga were skeptical to JRN of their athletes' predictions, people from each camp saying times two minutes slower would be more likely, one minute slower in a best-case scenario. But whatever the prediction, Kipsang was clear to fellow past champs Feyisa Lilesa (Ethiopia) and Dickson Chumba (Kenya) about one thing: he wants a more conservative first half than last year so that there's more room to work in the second half. Both Lilesa and Chumba predicted 2:04 times, Feyisa 2:04:40 and Chumba, the only athlete to express concern about the new Tokyo course's susceptibility to headwinds over the last part of the race a 2:04:58. With the first group pacers anticipated to go out at 2:54~55/km none of them may get exactly what they're looking for. Alongside the three past men's champs, the only three Japanese men to try to go with Kipsang last year, London World Championships team member Hiroto Inoue (MHPS), half marathon NR holder Yuta Shitara (Honda) and 2016 National XC champ Takashi Ichida (Asahi Kasei), were all back. 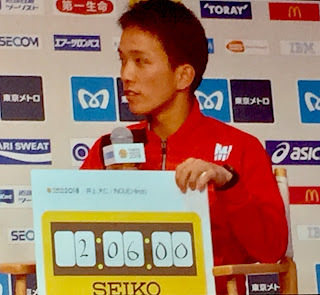 Inoue predicted a 2:06:00 Japanese national record for himself, ten seconds better than Shitara's January prediction. Today Shitara backed off that time, causing surprise when he held up a 2:09:00 prediction. 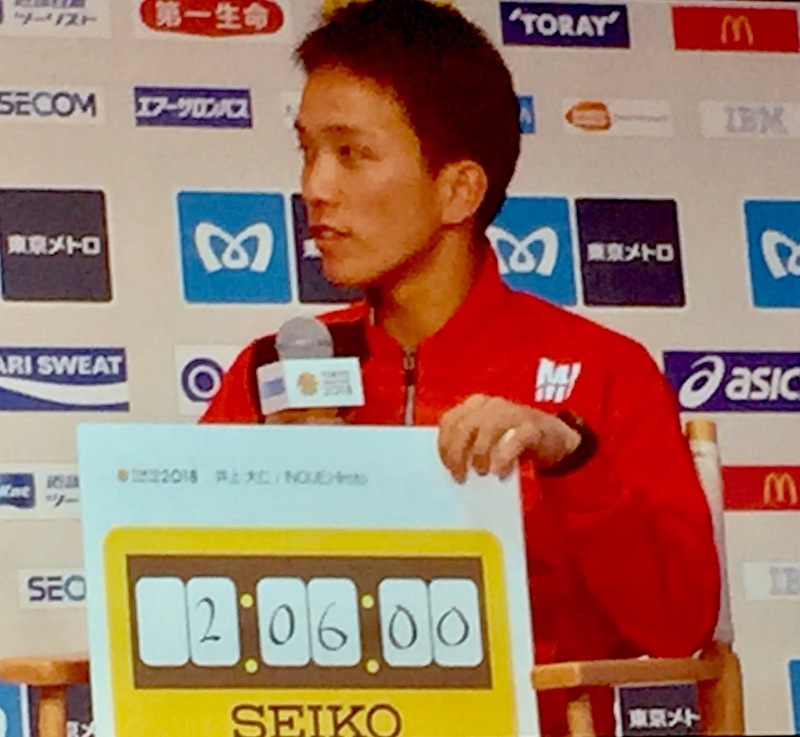 He clarified that he was more interested in "beating foreigners" than in running for a time, that achieving that would bring the kind of time everyone expects of him, and that the 2:09:00, a PB by 3 seconds, was his worst-case prediction. Ichida, who ended up barely sub-2:20 in his debut last year after a fast first half, was quiet onstage as he predicted a modest 2:07:59. Along with the big names, plenty of competition remains for the win and for top Japanese honors. High-profile scratches include 2:04 man Tesfaye Abera (Ethiopia), Tokyo regular Bernard Kipyego (Kenya) and Rio Olympian Suehiro Ishikawa (Honda). On the overseas front, U20 world record holder Tsegaye Mekonnen (Ethiopia) and 2:05 Kenyans Amos Kipruto and Gideon Kipketer are heavy duty contenders, with past World Championships medalist Vincent Kipruto (Kenya) and the debuting Simon Kariuki (Kenya/Nihon Yakka Univ.) potential catalysts to a more unpredictable race. On the Japanese end, Hiroyuki Yamamoto (Konica Minolta) and Hiroaki Sano (Honda), both with 2:09:12 bests in Tokyo different years, are the only other active sub-2:10 men in the field, but there's a lot of hope for breakthrough performances from past Hakone Ekiden stars like Tadashi Isshiki (GMO), Yuki Sato (Nissin Shokuhin), Daichi Kamino (Konica Minolta), Akinobu Murasawa (Nissin Shokuhin) and, in his debut, 2017 National University Half Marathon champion Kengo Suzuki (Kanagawa Univ.). All of them but Murasawa will be chasing qualification for the MGC Race 2020 Olympic Trials, a race open to anyone who breaks 2:08:30, the first three Japanese men under 2:11:00, and the next three if under 2:10:00. 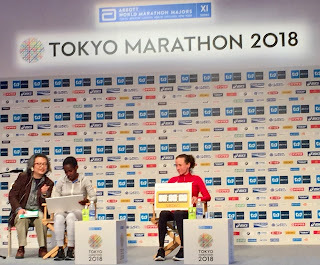 Aga and London World Championships marathon bronze medalist Amy Cragg (U.S.A.) were the only elite woman brought out onstage, 2017 Paris Marathon winner Purity Cherotich Rionoripo (Kenya) announced but then said to be sitting the press conference out after feeling unwell. Alongside Aga's brash 2:18:00 prediction, Cragg said she hoped to run 2:22:59 with the caveat that while she'd like to run a fast time her priority would be placing in the top three. To get there she'll have to deal with past winners Birhane Dibaba (Ethiopia) and Helah Kiprop (Kenya), both 2:21 runners, as well as 2:22:57 Ethiopian Shure Demise. One thing none of them will have to deal with is top-level Japanese woman, Tokyo still not counting directly in national team selection. It's a slightly better situation, the MGC Race standards making it possible to get in via a sub-2:24:00 or a two-race average under 2:28:00, but still the best Japanese woman in the field is Hiroko Yoshitomi (Memolead), a 2:32-level runner who did back-to-back 2:33 marathons the last weekend of January and first weekend of February. 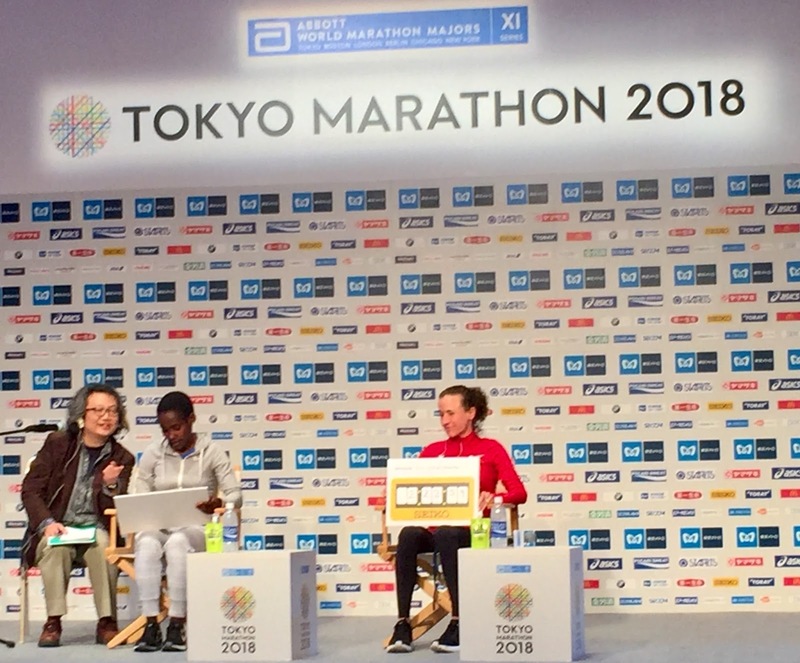 2016 and 2017 Osaka Marathon winners Yoshiko Sakamoto (YWC) and Yumiko Kinoshita (SWAC) are both in the race on the lookout for PBs, but it'll be a tough challenge for any of them to make the top five even with the withdrawal of Meseret Defar (Ethiopia). The Tokyo Marathon will be broadcast live both inside Japan and worldwide. The worldwide feed will focus on the lead men's and women's packs, cutting out most of the Japanese men's race and the back-and-forth coverage that makes Japanese TV marathon broadcasts the most interesting in the world. Look for the international feed at 9:00 a.m. Sunday Japanese time on networks including Youko Sport, Eurosport Asia, StarTimes, NBC Universal, ESPN International and TV Global. For those interested in seeing a potential Japanese men's national record, the Japanese feed may be available here starting at 8:30 local time.